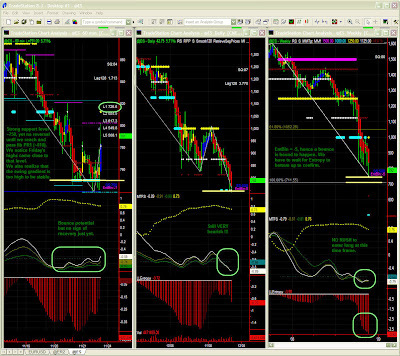 Please tell me about your trading, how you use this report, how successful you are with it. Most non-users take it as context information and make money filtering their own trades with it. Obviously, it is only a daily snapshot, and it is not as good as seeing it live. The reason for this question is that this technology will eventually be sold during the course of 2009, and only users who have expressed interest stand a chance to be listed as exceptions to the license's exclusive rights. Anyway, we still have a few months ahead of us. EURUSD: The pause announced on 1.295 resistance level lasted about half a day after which € charged in to test a stall level at 1.306. Next resistance level is 1.318, but energy is now lacking a bit. As mentioned on the weekly report, there is now a definite change in mindset and the $ will certainly weaken (is deleveraging coming to an end...?). 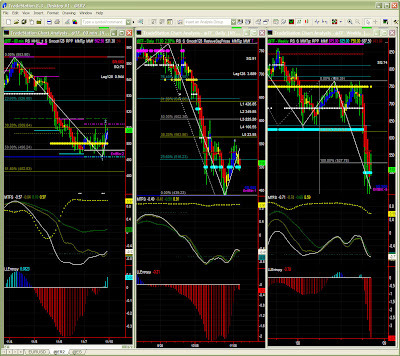 For the time being €/$ stays in a channel (60mins) and should eventually reach 1.306 and then 1.330. Lack of energy and volatility make it however difficult to detect retracement points along the way. ER: The resistance level mentioned yesterday is still there, and despite some minor profit taking, ER has proven quite resilient. Here again, energy starts lacking so there is a good chance of erosion. Maybe a good chance to try and enter long on aggressive limit orders. With a bit of luck, one can maybe enter long below 420 within a day or two. ES: Again, very similar situation. ES found enough impetus to go test the 875 resistance level (yesterday's high of 874 to be exact). Here too, the change in mindset is obvious, but we can also try and enter agressively as we have a typical "failed recovery" pattern on the Daily chart, so a retracement is almost already written. ES may possibly hover high still, but it should eventually retrace to the high 810s, low 820s before breaking the channel and travel to 1000. Obviously, we'll also play the channel breakout if the retracement proves too contained. Again, it is interesting to see how accurate a scenario can be with however that same caveat of volatility acting as a time compressor. 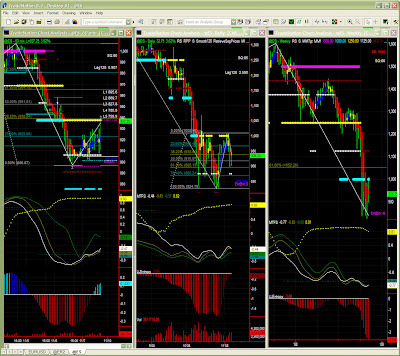 Oh well, it is a daily report, so users of our technique will obviously adapt to lower time frames, and others can always contact me for custom market analysis. EURUSD: We saw that bounce to 1.27, which broke easily, so we stayed long to the next very clear resistance level at ~1.295. It is a resistance level which could break later on even if a pause is likely today. We'll provide new targets tomorrow. ER: A similar story in a way as i announced the 440 target without fully anticipating it could be hit the same day. We do have an upper bias in the short term but profit taking is likely. The high 430s area is a substantial resistance for now, and even if we go higher over the next few days i.e. ahead of the long weekend. A retracement is more than likely so long term players do not have to rush into the market just yet. ES: Very similar situation with a resistance level around 850. ES is short term overbought so should pause on its way to 875. Again, this is short term play, and not a motivation to buy frantically just yet. ES will retrace to the 810 area at some point. Oh well, yes, i was right. I announced that purge and short sellers are happy today but i won't boast or rejoice in sympathy for millions who are depressed by these markets. To those i just have to say that the bottom is now around the corner. Markets have now reached the levels they were supposed to reach. ER: There we are. We've hit 380, so we can now rest for a while. Volatility could exarcebate profit taking or some short squeeze, but more realistically, ER should stay low to dissipate the massive negative energy built in the market. Over the medium term, 437 is key level. ES: Same story. We're now on 750 which is quite a strong support level. Here also a bounce is possible if not likely (tgt: ~781), and here also bear pressure is enormous. Short sellers may want to take profits and/or tighten stops. Over the longer term, we still have a possible ES target around 710, but 750 could still hold so we'll remain quite careful here. The purge is not technically over and volatility can play more tricks. At this juncture, one can take profits and wait for a clearer picture, otherwise short intraday time frames are recommended. EURUSD: 1.27 is now a STRONG resistance level but shows weaker energy levels. Our preferred scenario is the continuation of current drifting with steps on 1.257 then [1.251-1.253]. Obviously, in absence of intrinsic energy, EURUSD will be more sensitive to exogenous factors. ER: Here also, lower highs and lower lows should normally indicate lower support levels. However, the stunning recovery on day close proves that 437 is still going strong. We will check for a channel breakout to change our mind. Until then same drifting, i.e. cautiously short. ES: Fib/ MM target levels concurrently on 828 have been tested successfully, but there is still no underlying conviction the market is ready to turn around just yet. Here too, we'll check for a channel breakout on the daily chart. Some will start finding these markets a little depressing, yet sailors also don't often suntan on the deck either and have to go through rough seas now and then. Some traders/investors paid too much attention to their skin and can't take the pressure now. Anyway, yesterday was again a little more abrupt than anticipated but we hade seen a lot of buyers giving up (500 tested as resistance on ER for instance) so a support level breaking induces a lot of selling searching for the next level. Today, on EURUSD a substantial level has been hit around 1.245 even if the underlying trend is still there. Maybe a pause or a bounce today or tomorrow, but now aiming at 1.22 as mentioned in previous posts. ER: Negative sentiment has to take ER to 437 close to recent lows, which will be the recent test. This revives a scenario of mine in recent weeks of an absolute bottom around 380. ER: I mentioned yesterday that ER would try and find support somewhere above 482. There we are now and even if we could see some reprieve today or even a minor bounce, 500 has now been tested again as resistance and we could actually go lower in the next few days. Indicators however indicate more a drifting situation than an outright fall, so this support (or the next one) can hold. We do not have a strong indication of a new round coming on Monday, but we may get there in stages testing ground. First step would be to confirm 940 as support. Daily: Aren't we all a little tired of this all? While we start seeing some upper bias in this market, there is certainly not enough energy to even think of passing 1000 in the short term. Will we gather forces or will market players heal wounds and rest a bit in this trading range? We'd all love to turn the page and be bullish again but who's pulling the trigger first? Like everyone, we have to be very cautiously optimistic this week again. Some indicators show a bounce coming but at the same time do not anticipate enough energy to carry through to any sort of full strength recovery just yet. It could take a few more weeks, so we'll call it a pre-alert or early warning and will check lower time for confirmation as signal later on. Please don't read more into these lines: we are NOT buying yet! Options (RUT): put spread / split butterfly still a reasonable option but caution is required. Nothing with taking profits now. Last week monday, i clearly mentioned a "cautious retracement trade" was possible, like a put spread or a split butterfly. We certainly had no indication of a strong bounce just yet. Hmmm, can we really say more this week? 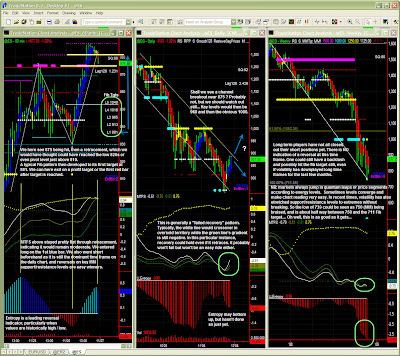 Dynamics are still the same, so is our word of advice to follow charts on shorter time intraday time frames. EURUSD: I was almost spot on last week saying we had a clear support and yet only limited bounce potential to 1.29. Again €/$ should remain fairly range bound in the short term with a slightly lower bias (no indication yet of ~1.2695 support level breaking). Upper resistance remains around 1.293. Long term we still have a possible target around 1.22 almost hit already on Oct 28th, should this 1.27 key support level break eventually during the course of the week. This ~2cts range is however relatively tight and we should therefore remain cautious of breakouts in either direction. ER Daily: Key 500 level! There is no guarantee 500 will hold, yet it is likely to do. There is still some remaining downward pressure which could dissipate to open the way to a target around 560. We'll keep checking price segments about 32 points apart. Should 500 break, price segments work the same on the way down with a support on recent lows exactly 2x32 points lower. For the time being, "hangover" mode still prevails though, so ER could remain range bound for a few days. Significance level is lower so we will not pay too much attention to MTFS and Entropy. However a straightforward recovery (blue bar) is very very unlikely. We have to admit this crisis has surprised us already but there is nevertheless still a tremendous amount of downward pressure to dissipate, so it is way too early to rejoice and buy frantically into this market even if we may have an up week this week. We must keep at the back of our mind that if 500 and 440 break, the TRUE support is around 380. Sounds frigthening doesn't it? 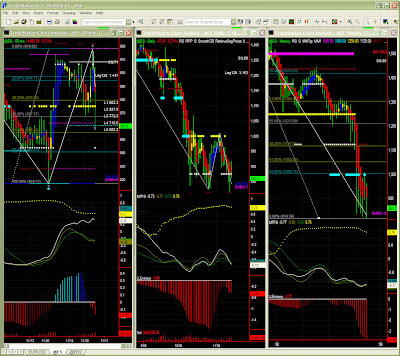 Again, we'll have to keep this time frame as background info only for now and follow the 60mins charts rather. Are we waiting for a big Obama party today ? Are we confused between this early market recovery while the mess is not fully cleaned up still ? Is it yet another eye of the storm ? Yesterday was certainly calm in relation to the volatility we're now almost used to, except maybe for €/$ which broke the 1.27 MM support level to reach a Fib target around 1.255. 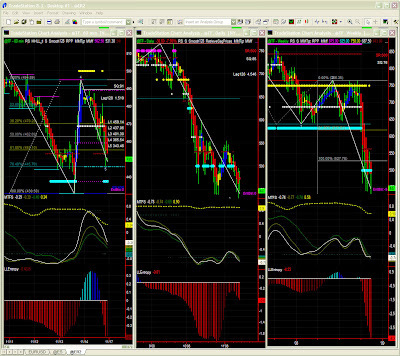 EURUSD should carry on hovering around same levels, and we recommend using a tick chart for intraday movements. The lower bias is still there at the moment but as said earlier, it could well bounce because 1.27 is actually stronger than the deep penetration we've seen could imply. If now tested as resistance then we will look at a lower target maybe back down to the 1.22 levels. ER: Stalled short of 550, on its way to 562. A retracement would be in order but ER is holding nicely at these levels. 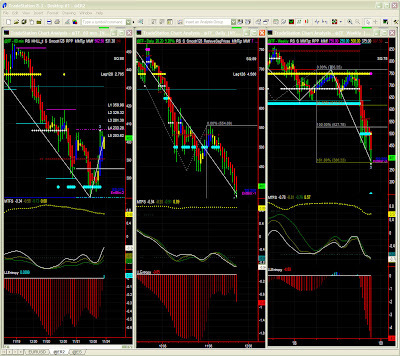 One cannot discard either scenario right now, so ER can just as well go and test 562 or retrace back to low 500s again. In the short term, ER is still pushed slightly upward but the bias is fading at the moment. Will volatility play tricks again on Obama Day?